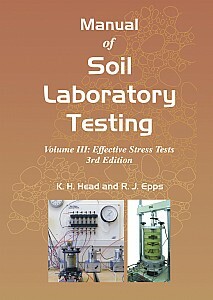 This third volume completes the long-established key handbook for the laboratory testing of soils. The text covers soil testing in terms of effective stress, for which the measurement of pore water pressure is the essential feature. The principle and theory of effective stress are explained, practical applications are outlined, and the apparatus used, including its calibration and checking, is described. The book has been updated to reflect current practice and instrumentation using electronic data capture. The first two chapters provide the theory. These are followed by a description of the apparatus and associated instrumentation for effective stress triaxial tests and then the test procedures themselves. A description of the accelerated permeability test and procedures for unconsolidated undrained and consolidated undrained triaxial compression tests using a mid-height pore pressure probe have been added, and reference to changes due to Eurocode 7 requirements for sample quality are provided as required. Professionals, academics and students in geotechnical engineering, consulting engineers, geotechnical laboratory supervisors and technicians will all find this book of great value.